Aerial view taken 21 May 2011 shows the eruption of the volcano Grimsvotn in the south-east of Iceland. It is sometimes hard to understand the size of the Icelandic volcanic systems. We often read statistical things like “Half of all the ash in Europe” and “One third of all basalt produced in the world” and we still do not really get it because we lack a point of reference. Instead we time after another get stuck with what looks big on the surface, such as large stratovolcanos in the Andes or big caldera formations like Yellowstone. But, by looking at what we see we miss the big picture. Let me start all over again at the beginning. What is a volcano? A volcano is in one aspect like an iceberg. Most of it is hidden. When we think about volcanoes we have to start at the beginning of them, and that is where the magma comes from that ultimately forms the small part that we can see. In Iceland there are two processes that produce magma. One is basalt formed as the MAR (Mid Atlantic Rift) is spreading. That is called MORB-formation (Mid Ocean Ridge Basalt). It is basically decompression melt that occurs as the plates are pulled apart at the MAR. This is what creates most of the magma on the Reykjanes Peninsula and north of Theistareykjarbunga. The other process is the nascent mantleplume that is burrowing ever downwards into the mantle. How it started is not well known, all we know from petrochemical evidence is that it over time has increased in flow-mass and depth. And that it is fairly stationary at the center of spread in Iceland. Basalt formed from the mantleplume is hotter and petrochemicaly different compared to the MORB derived magma. This kind of basalt is typically found in relatively pure form in the Bárdarbunga and Grimsvötn volcanic systems. There is a general trending away from those two towards the outer edges of Iceland where gradually MORB increases and plume derived basalt decreases. Grimsvötn volcanic system consists of 6 en echelon central volcanoes and a fissure swarm that is between 150 and 190 kilometers in length. Here the fissure swarm is imperative for understanding the deep magma reservoir. As Iceland is pulling apart with 0.9 centimeter per year at Grimsvötn an upside down canyon is formed from the mantle and up under the volcanic system. As it spreads the canyon is filled with magma that enters the system mainly via the mantleplume, but partially from MORB-processes. This process explains how a 400 cubic kilometer deep reservoir can form under the Grimsvötn volcanic system. The same would obviously also be true for the Bárdarbunga system. So, under an area of 190 by 50 kilometers we have roughly 800 cubic kilometers of magma. Plate tectonics in Iceland. Wikimedia commons. Note that the Eurasian plate is relatively stationary compared to the North American Plate. The Micro-plate mentioned in this article is delineated from Reykjanes Peninsula, up to Langjökull, via Hofsjökull and into Bárdarbunga/Grimsvötn where it then turns to the SW and goes through Myrdalsjökull and onwards past the Vestmannaeyjar. From the deep reservoir conduits lead up into shallow magma reservoirs that are commonly called magma chambers. In the case of Grimsvötn the high rate of eruptions has led to these being constantly open, so there are few and small earthquakes occurring as magma move upwards. We also know that there is more than one shallow magma reservoir under Grimsvötn from GPS-trajectories during eruptions. In other words, Grimsvötn often alternates between different magma chambers during eruptions. Now we have arrived at what we see as Grimsvötn. It is a complex volcano that has little resemblance to what we would think of as a strato-volcano. In fact it is a strato-volcano with Tuya-formations, shield-formations and dome-formations all at the same time. But, it is also a caldera-formation. Currently we know of 3 separate calderas at Grimsvötn and that is the reason for the peculiar form of the caldera-system. As the last ice age wound down the isostatic pressure relief caused a marked uptick of eruptions in Iceland. The pressure from the ice-cap diminished the influx of magma and few eruptions occurred. This caused magma to pool for a longer time in the deep reservoirs, but also in the shallow magma chambers under the central volcanoes. As the ice melted and the ice-age ended this caused rapid formation of new magma at depth and hot fresh magma to intermingle with old stale crystallized magma. It also caused lowered pressure in the shallow magma chambers. 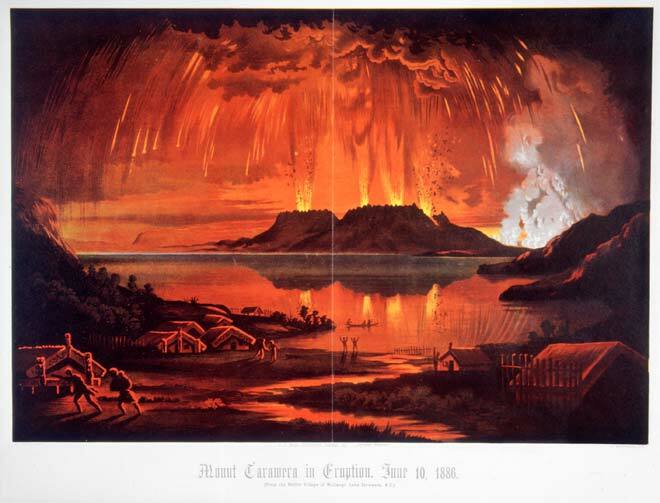 In a few thousand years some of the largest effusive eruptions occurred on the planet during all of Holocene. It was for a time even believed that one or more VEI-7 eruptions happened in Iceland. The last part has though been hotly debated. The opponents point to the crust being too thin to be able to withstand a large enough shallow magma reservoir, and the proponents shouted back that the amount of ash released in some eruptions was so big that they had to come from a VEI-7 eruption. In this fight the biggest stick thrown around was the Saksunarvatn Tephra with a face value of 150 cubic kilometers (DRE)*. First of all, the Saksunarvatn is not to be found in Iceland. Instead it is a lake on Streymöy in the Faroe Islands. The tephra was not found by geologists, instead it was found in 1968 by Waagstein and Johansen. The ash layer has since been found in bogs and lakes all over Scandinavia, Denmark, Germany and in ice-cores on Greenland and Spitsbergen. It is nowadays used as an important stratigraphic layer when dating eruptions, archaeological sites, paleobiological sites and for climate research. The problem is that there has been a long standing state of confusion caused by the interdisciplinary nature of the find. Basically it has been biologists and archaeologists that have studied the Saksunarvatn layer, and they have just said “look at the pretty sand, it looks like one big layer”. It took all the way until this decade before a few volcanologists took a look and said “wait a minute, something is funky here”. And then some of the big guns of Icelandic volcanology were on it like bees on honey. Now, go and get something to drink and sit down and relax. We are only going to rewrite volcanic history and partially volcanology itself. So, no big thing at all. Saksunarvatn in the Faroe Islands photographed by Brian Aslak. I read a couple of hundred scientific papers a year in the field. The vast bulk of them are produced so that various researchers can aid their careers to plod onwards to Professor-hood. They tend to be unimaginative, technical and most often debates ad nauseam some obscure detail. Then there are those papers that actually move science a bit forward and make me happy to read. Once upon a blue moon I get across a paper that changes science, the ones that leaves you sitting in cold-sweat staring blankly in the wall uttering intelligent things like “duh” while longing for a good shot of whiskey since you have to remodel all that you thought you knew. “The evolution and storage of primitive melts in the Eastern Volcanic Zone of Iceland: the 10 ka Grímsvötn tephra series (i.e. the Saksunarvatn ash)” by David A. Neave, John Maclennan, Thorvaldur Thordarson & Margaret E. Hartley is one of those very rare birds. Be warned, it is not an easy read. It is a highly technical paper on petrochemical analysis. Instead of going into the technical details of this very well written paper I will instead move unto the consequences in an understandable way for the layman. Let me first start with this, the Saksunarvatn Tephras where laid down in 6 large eruptions ranging from 1 cubic kilometer to 30 cubic kilometers. The figures here are the most conservative estimates. One of these five eruptions travelled in the direction of the Faroe Islands and the other four travelled towards the northwest. Now it becomes even more interesting. The timeframe for these five large eruptions is 500 years. That means that in a very short geological time-span Grimsvötn suffered two VEI-5 and 4 VEI-6 eruptions with a combined conservative output of 150 cubic kilometers Dense Rock Equivalent (DRE). * This is a rate of large eruptions unheard of in volcanology. There is more. The petrochemical analysis shows that the magmas formed Chrystal inclusions at very different depths and temperatures. The scientists that wrote the paper very markedly point out that a partial explanation is likely to be found in our models of heat and depth for formation of some of the samples, but this is just a call for more scientific studies in their field. These ambiguities are though comparatively small and we end up with crystals that have formed in different temperature melts at varying depths. This leaves us with a magma composition that formed inclusions between 1140 to 1300 degrees and at pressures warying from 1 to 7.5kbar. Or in other words, some of the magma was old mush filled with melt inclusions and that had undergone evolvement, and other magmas was hot unevolved magma with less melt inclusions. In even simpler terms, during this set of eruptions magma from 2 to 15 kilometers in all stages from stale to fresh plume origin squirted out intermingled with each other. This more or less ripped out the shallow chambers and the conduits down to the deep magma reservoir. In turn the deep magma reservoir answered by pushing up magma on an unprecedented scale. Even though the magma production in that part of Iceland is very large it does not explain what happened and the caldera formations are too small to explain it. One explanation would be that a Graben would have formed all along the Grimsvötn Volcanic System with an average depth of 39 meters, but there is no evidence to be found now for that. The other possible explanation is that locally plate tectonics switched direction for a while. Obviously I am not talking about this comparatively small eruption pulling Eurasia and North America towards each other. Instead I am talking about the micro-plate that exists in Iceland moving eastwards for a while. It is likely that both things happened at the same time. By now the depression would have either uplifted or been filled in by Iceland’s large rifting fissure eruptions (Laki for instance). In regards of the micro-plate moving afterwards hypothesis, I can only say that for a while afterwards there was a few rather large eruptions at the western margin of the micro-plate. Largest among those is the Skjaldbreidur shield volcano that started to form 500 years later. A small part of the Skaftár Fires fissure (Laki). After this eruptive sequence Grimsvötn was left a shadow of itself. The volcanic system was gutted and 37.5 percent of all the magma was spent. Any normal volcano with a normal rate of magmatic influx would now have gone into dormancy lasting tens of thousands of years. If Grimsvötn erupted in the following thousands of years is unknown, but the first known return eruption happened 3 800 years later (4 550 BC) and it was a big one. It was the 9.4 cubic kilometer Botnahraun that formed the Lakí Mountain among other things. After that Thordarhyrna had two large effusive basalts in the same size range, namely the Bergvatnsahraun (3 550BC) and the Raudholar/Brunuholar eruption of 1 950BC. After that small explosive eruptions started at the volcanic center ranging up to VEI-2. This 3 800 long period of small scale volcanism ended with the 15 cubic kilometer Skaftár Fires at the Lakí Fissure. During those 10 000 years the volcano had not only replenished all of the lost magma during the Saksunarvatn Tephras, it had also replenished the large effusive hraun-eruptions. After Lakí it was supposed that larger eruptions were unlikely, but once again Grimsvötn had a surprise up its sleeve. In 1996 Grimsvötn started a series of VEI-3 eruptions ending with the even larger VEI-4 eruption of 2011. This means that the system is now fully reformed and this has consequences about how we look at it in the future and this is something that I will get back to in the next part. *At Volcanocafé we have the good fortune of having Professor Albert Zijlstra as esteemed administrator and contributor. Albert pointed out when he saw the article prior to publication that there seemed to be an error in the figure of 150km3 DRE output in the eruptions. He came up with very strong arguments, but in the end I used the figures given in the papers up above. I was though intrigued and doggedly dug onwards and in the end I had made Isopac-projections and calculated the volume of the 3 calderas at Grimsvötn. The result ended up between 60 and 120 cubic kilometers DRE, a figure I at least am happy with. Thank you Albert for forcing me to not be lazy while writing and making me do the calculations myself, in the end the article is much better with this small addendum. Another point I wish to do, the 500 year timeframe is probably a bit over the top, the ice-core samples seem to indicate a shorter timeframe. What an absolutely cool, thorough and very informative article, Carl. Thank you! Thanks for the great article, Carl, looking foward to Part two. It is amazing that there could be any tephras found anywhere in the region – the amount of glaciation, weathering, and open ocean in those parts would suggest a near-constant erasure of anything volcanic older than a few thousand years – and this is a testament to the size of the system, it seems. I had to scrounge hard for data to be able to do an isopac for it. And even then the isopac measurments are inevitably low in value due to exactly the things you are pointing towards. Very interesting Carl. The first thing that occurs to me is… why Saksunarvatn *Tephras*? What switches the system from the more expected effusive basaltic eruptions – Laki-style at the largest extremes – to basaltic plinian or ultraplinian eruptive mechanism responsible for such enormous tephras? In this case it is probably ice-water/lava interaction that causes it. The eruptions from the central caldera tends to be explosive for that reason while the rifting fissure eruptions tend to be more effusive. As far as I know the gas volume is about the same for both (prodigious). The size of the conduit/opening is also important. A wide opening (a rift) gives a low pressure gradient and a stable, effusive flow (well, within reason. It can still fountain high). A narrow conduit gives explosive decompression on reaching the surface. But in this case the ice cover may be more important. Pure speculation on my part, Laki, which is supposed to be part of the Grimsvotn system was a big SO2 producer so Grimsvotn (which also erupted during the Laki eruption) is probably a big SO2 producer in the right circumstances. I skimmed the article (sorry, Carl; I’ll read it properly later) so not sure when the Saksunarvatn tephra originated but I guess it was nearer to the last ice-age when there may have been a lot more ice and water around. See this sulfate chart Karen – it’s the GISP volcanic so2 core data. The spike I have labeled as Grimsvotn is the likely caused by the Saksuvartn eruption (time period correlates very closely to this eruption). It’s nice to see that graphic being put to good use. Thank you! Thank you, more recent than I thought. More super-deep quakes in the Askja / Herdubreid region. Any thoughts / speculation on this from anyone who may know a bit more than myself? Generally it is a sign of new magma arriving from depth. In the case of Askja there have been small unrest in the last ten days with what might have been a short lived hydrothermal event (HT-spike) and many deep or anomalous earthquakes with magmatic signatures. In regards of Herdubreidartögl it is more surprising, it points more that the old intrusion that slowly has been hammering upwards could be receiving a refill. The original earthquake swarm started at 20km depth under Upptyppingar and moved very slowly to the current location slightly north of Herdubreid. Previously no deep new magma has arrived at Herdubreidartögl. If the new magma pushes into the old intrusion things could get interesting. There are a lot of deep earthquakes now in Iceland, I see this as a sign of another magmatic pulse arriving via the mantleplume. I didn’t have a chance to look into it properly last week, but while checking the weather conditions one day, I noticed a small cluster of quakes (all <2 I think), stretching from the Grimsvotn area towards Laki. Not sure if anyone else noticed it at the time. I was more concerned with driving conditions at the time, as I was in a slightly isolated area. From memory, it was about 9-10 days ago now. Why doesn’t the spam filter give an automatic pass to any comment that has no links in it? All Admins have at times been binned by Akismet. You guys would not believe the volume of spam about Ugg-boots we get now and then. Something I like to mention quite a bit was alluded to in this post – the interaction of past glaciation hiding large eruptions. One of the important takeaways from this, isn’t that there was no tephra deposited in Iceland from this eruption. There almost certainly was, but most of that tephra landed on top of a glacier in all likelihood. While a good amount of the Vatnjokull glacier is likely still the same as it once was, it’s also quite likely that a LOT of the tephra that was deposited during these eruptions on Iceland was washed away when glaciers started to melt, likely going out to the ocean, or mixing in riverbeds in non-stratified layers. Then you get the additional complication of trying to gauge how much of this tephra is sitting at the bottom of the ocean. How much of this tephra that hit the water was set adrift? How much was thrown into the atmosphere at the time to disperse gradually around the globe? Knowing all these complications, I think it’s fairly evident that gauging eruption sizes in areas that were covered glacially, and areas where a lot of the ash was likely deposited into the ocean will be inherently innaccurate. It’s one of the reasons I personally tend to look more simplistically at the size of a caldera to gauge how large an eruption’s size was (or in this case, possibly look at the drop of the graben). I think you misunderstood me there. I meant that Saksunarvatn is not to be found in Iceland from a geographical standpoint. By the time of the Saksunarvatn-tephras eruption Sequence Iceland was as ice-free as it is today. There are numerous ash measurments of it to be found in Iceland. Ah, okay, my fault then. Have any of Saksunarvatn Tephras been found in the UK? Yes, they have been found in Scottish bogs and lakes among other places. canyon which is the heart of the original ?Columbia river Basalts, about 22 mil years ago. Did not have a camera though the people with me did-but they were looking at Mountain Goats and Sheep. Found this on the interest very interesting map of the Alboran earthquakes. I wish they got that it is generally a very good idea to go to a top-down representation now and again. This way it is actually pretty useless. But, pretty nonetheless. Most youtuberswouldn’t know what they are looking at either way, but if it LOOKS striking, they can get that many more “clicks” and “views”. Bad attempt at using a polysheet where inappropriate, but nice effort. I would have to imagine that the larger Icelandic eruptions were largely enabled by the massive ice caps that used to cover the country. Currently, I agree that the shallow magma chambers and weaker crust make it seem unlikely that there could be VEI-7 eruptions in Iceland. But you don’t get 13 kilometer wide rhyolitic calderas from small effusive eruptions (Torfajokull in this instance). One interesting thing about Ice-caps that doesn’t get discussed as much is that larger magnitude eruptions usually occur during periods of high glaciation. Once deglaciation occurs, you may get a temporary flare-up in activity from the loss of pressure, but during the inter-glacial periods, you get more frequent small eruptions as there is less pressure overlying the central volcanoes. There is an interesting paper that analyzed the many caldera forming eruptions in Kamchatka, and it found that the majority of the large eruptions there occurred closer to periods of glacial maximums, and that the eruptions during de-glaciated periods were more frequent, but much smaller. I would have to imagine the initial caldera formations at volcanoes such as Katla, Askja, Torfajokull, and others were possibly enabled by the fact that glacial pressure allowed the magma chambers to grow considerably larger than they currently do. Either way, just a thought. Perhaps the glacial periods and subsequent longer repose time ,allow large rhyolite deposits to evolve at the cooler margins of the caldera magma chamber? Doesn’t have to be Rhyolitic. Not all big eruptions are Rhyolitic – the main thing is that a large ice-cap puts a lot of extra pressure on a magma chamber’s lid, making the lid essentially bigger and stronger. That allows more pressure to build before it gets released, which allows for the formation of bigger magma chambers. It’s probable that more magma could evolve in situations like this, but that’s fairly unimportant in the grand scheme of things. Would it produce bigger magma chambers, or shallower ones? The increased overburden pressure would move the depth where the magma is neutrally buoyant up, wouldn’t it, promoting shallower chambers. This would have two effects. One, where the ice was thickest, the neutral buoyancy level might actually touch the ice, or get close. Magma that burrowed up to the ice might go up in phreatic eruptions, explaining some of the evidence for more (and more violent) eruptions during glaciation. Two, during deglaciation the neutral buoyancy depth would descend, and the magma chambers surviving to this point would find themselves positively buoyant, which might lead them to erupt during the deglaciation period. Calderas would form as the chambers erupted and collapsed, and then new, deeper magma chambers would begin to form at the new neutral buoyancy depth. I would like to emphasize a bit what CBUS just wrote for your edification. Rhyolithic explosive eruptions in Iceland are the exception, not the norm. The Saksunarvatn Tephras was not rhyolithic, they followed the main Grimsvötn line. No rhyolithic eruptions are known from either Grimsvötn, Katla or Bárdarbunga. Caldera eruptions are the exception in Iceland as well as worldwide,so? Uhm, what I tried to point out is that the caldera eruptions at those volcanoes was NOT rhyolitic. I know that in your worldview everything is rhyolitic or cyptodome induced. But in the real world most caldera formations are not rhyolitic. Neither is every darn spot on the planet a cryptodome. Start getting the picture, it is annoying people no end that you never ever listen. I agree. All the cryptodome theories are really annoying. Or….. you could just not incessantly mention Cryptodomes and Rhyolite when it has already been discussed ad nauseam why they aren’t the case. Believe it or not, this isn’t all that hard. You guys started mentioning c#$&%@domes,I have not mentioned the term for weeks.Not all large eruptions contain evolved magmas, but most do,either dacite,rhyodacite or rhyolite and maybe in some large basalt eruptions,the evolved magma’s play a role as an eruption enhancer? 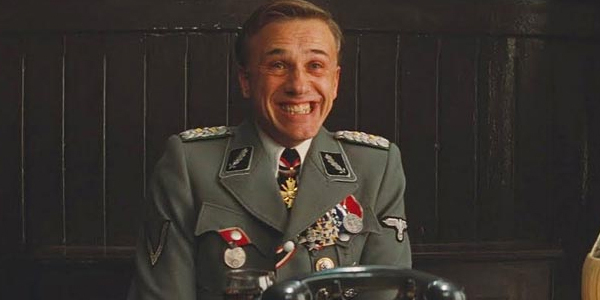 Actually, it was you that brought up all the cryptodome crap. You do realize Tyler that a crypto dome is a magmatic intrusion (usually viscous), that has not breached the surface.It is not a new volcano forming or a magma chamber and certainly not fiction,even if it does not apply in the Bardarbunga situation.The crypto dome 9n Mt St Helens was not the magma chamber ,that resides some km under the volcano,it was magma that could not find a clear conduit and so expanded the flank of the edifice. And for those who keep track of the green stars of Bárdarbunga. This evenings green star started it’s career as an M1.7 before being upgraded, it seems like the automatic system is still having a problem with the larger Bárdarbunga earthquakes. Desnarked. Keep a lid on it. Sorry for the sarcasm/humour,but it should be pointed out that drum appears to be scaled to a rather sensitive level and that makes the relatively mundane look more impressive ? The Icelandic SILs are never rescaled, that is how a M3.3 looks on the DYN SIL. Jon says this was a LP event. Does that mean anything interesting? Full moon tonight over Iceland. Yes tidal effects on volcanism is very much debatable but if there’s a time for magma to punch through might as well be high tide. I think that a VEI-7 eruption of the Grimsvötn volcanic system could trigger pyroclastic flows that large that they can easily travel over the Atlantic Ocean toward the Faeröer Islands. Pyroclastic flows travelling over water can cover large distances. And North-Western-Europe could be blanketed by fall-out tefra. I would severely doubt the pyroclastic flows would go that far. Iceland is having a wee little interesting fizz of quakes at the moment… Bárðarbunga… Askja… Herðubreið… a couple in the general area of Gjalp… a few Katla quakes… even a wee swarm SW of Hekla right on the edge of the sprungur area. There has been an interesting fizz of shallow earthquakes the last few months in the home country,along the margin of the Reporoa caldera . I think this is a continuation of the rifting event that opened the 45 km fissure leading to the 2014 eruption. I believe the periodic M3+ quakes are caused by the BB chamber draining into the hot molten fissure that is still opening up wider due to this continued rifting event. The volume of a mere 1cm of rifting along the length and depth of the fissure would be quite significant and could cause drainage and collapse above the chamber, thus the periodic nature as the structure above fails at a determined amount of drainage. How does a fluid drain into a higher pressure environment? Are you suggesting the creation of a graben in the caldera? But there has been quake activity all along the fissure since the eruption started, also, sometimes the expansion due to rifting is taken up by widespread stress buildup in the surrounding landscape rather than actual fractures, that is how the fissure formed so quickly, the area was already under a huge amount of stress that opened like a zipper, at least this is what I picture the situation to be. This expansion of the fissure would not need to be much at all to generate a huge increase in volume that would require filling. Magma was flowed into the fissure initially and then erupted to the surface, then the pressure dropped to a level low enough it could no longer sustain the eruption. If the fissure opens up due to rifting the pressure would drop again and it seem logical to me this void would be filled from the same source as before, the chamber under BB. Problem is the source magma for Holuhraun was at a depth of around 20km and the earthquake activity is in a different location and at a depth of less than 5km? Can you please site your source the magma was from 20km, I have never seen that stated as fact? And what does that have to do with what I am proposing, I am suggesting the chamber draining now, very slowly, is the same one that caused the caldera to subside before. That chamber one was probably at 10-11km depth. I am not going to argue with you on it,but to say I falsely stated the facts,I said around 20 km,this study narrows it down to 15 to 20 km. That source would need some re-pressurizing. Also, the dykes will have solidified and are not available anymore. A new dyke will have to form and this may not go the same direction. Small quakes along the 2014 dyke are likely due to the cooling and not related to a new refill. The recent quakes within Bardarbunga are a bit more puzzling. They avoid the region where the dyke went out. There are some within the caldera, and a lot are shallow and surround the region where the quakes clustered in 2014. So i think there are two effects going on. The shallow quakes on the ring are due to small collapses, perhaps made possible by some lubrication from water percolating down or magma percolating up from the shallow sill. The central, deeper quakes may be due to refilling of the deeper magma chamber. At the current time I see no indication that it is going anywhere else. Carl has talked about the deep connections between the various chambers, but at a shallower level the systems are well separated. I think the next activity in Iceland will be elsewhere. But I wouldn’t put any money on it. Albert that separation in location and depth was one of the factors I was trying to relate to Ianf,glad you brought that up and as for the cause,that has been the subject of intense debate and your hypothesis is probably as good as anyones,at this stage.Also ,as noted in the study above the source chamber for Holuhraun could have been deeper than 20km. Thanks for the reply Albert, I did not realize the dyke would solidify so fast. How quickly it solidifies depends on the width of the dyke. But this width is caused by the pressure from the flowing magma. Once the magma pressure drops, the pressure in the rocks on the side will push the walls closer together again. If you keep magma stationary in the dyke, a 1-meter dyke could solidify in a week. Bottom line: magma would not use the same dyke twice. In the above study,the ring fault subsidence was caused by doming of the shallow chamber caused by influx into the deep 20km reservoir.The caldera also elongated NE/SW.It could be going by that information ,that the on going earthquake events are resulting from more uplift in the caldera and subsequent movement at the ring fault particular in the NE section elongated during the formation of the dike,so does that indicate either more pressure from depth or a weakening of the caldera lid? I don’t think there is much evidence for inflation, and there are no earthquakes in the southwest but there are in the southeast. Also, the earthquakes are mostly very shallow which does not tally with deep inflation. The caldera will re-inflate eventually but I don’t think the current earthquakes are caused by this, at least not the shallow ones which are the large majority. I feel I have to answer to this. 1. The Bárdarbunga eruption did indeed start with a sequence of earthquakes deeper than 20km. These earthquakes started about a year prior to the eruption, they did though not happen at Bárdarbunga proper, instead they occured at other places that later was involved in the eruption. The reason for them not happening at that depth at Bárdarbunga is that the lower magma reservoir is open at the bottom to the mantle, think of it as a an upside down sail-boat hull. 2. There is ample evidence of increased spreading at Iceland, the current spreding episode started in mid-january with increased westward motion in many GPS-stations. This masks the uplift since the new magma goes to fill in the void created by the rapid spreading. The amount of spread is between 5 to 20mm in less than 3 months. 3. The amount of current deep earthquakes and the fact that they are spread over a large area with many volcanoes involved is the same as before the original Bárdarbunga eruption. I interpret this as a new magma pulse arriving from depth into the volcanic systems in and around Vatnajökull. I am currently expecting renewed volcanic activity in one of the volcanic systems in anything from 3 months to a year unless the current rifting and magmatic pulse does not stop unexpectedly. What it does illustrate is the tendency to take a short term view on volcanoes,whereas these events are years,decades and even in some cases centuries in the making.The current Bardarbunga episode has been brewing since at least the early 1970s, and a volcano like Mt St Helens is still probably working to some culmination ,after which it will possibly remain dormant for centuries? What? Where did you get the idea that Mt. St. Helens is working towards some type of culminating event? And what does anything Carl said have to do with taking a short term view of Icelandic events? Well Carl mentioned signs of magmainflux sometime before any eruption activity occurred,that illustrates ,in hindsight the build up to an eruption sometimes can be seen some years before in certain events.Mt St Helen is still dome building and the culmination could ,just a cessation of that activity or another explosive eruption and then it could go quiet for a long time,the point being it is still somewhat active and the active phase has not finished. The key here is the “sometimes”. The details are what matter here. As for St. Helens, I would say it’s pretty unlikely that we’ll see any big eruption for a long time here. Most normal stratovolcanoes do not erupt multiple VEI-5+ events in the same decade. St. Helens will likely need a good amount of time to rebuild after the 1980 flank collapse, I would say we probably won’t see another eruption on the scale of VEI 4-5 from St. Helens for hundreds of years. I say this based largely off what we know of the current state of the volcano..
Interestingly, there was a period where St. Helens had two VEI-5 eruptions within 4 years of each other, as well as an older VEI-6 followed by a VEI-5 less than 200 years later, so you’re not entirely wrong that it *can* have big eruptions in somewhat rapid succession (geologically speaking). With those events aside, the current state of the volcano suggests that it’s rebuilding after the partial destruction of the edifice. Right now, the dome building suggests that much of the magma, at least closer to the surface is degassed, and not explosive. Considering the dome growth and the fact that there aren’t large earthquake signatures here prior to eruption (dome growth), we can conclude that the volcanic system is at least relatively “open”. Even if there If there was enough pressure built up at depth, it would *likely* just push out the top since the resistance isn’t all that high, resulting in a mild eruption or further dome growth instead of anything on a larger scale. Of course, this is all just rumination and making assumptions that it will behave like most other volcanoes in a similar state. It’s far from perfect, but without enough information to draw conclusions from, this is the best information we have to go off. With the viscous dacite it extrudes,it is probably prone to getting a blocked conduit? An example of such activity is the resurgent doming after large eruptions. They may not lead to anything, for instance Toba resurged by 1100 meters but this never let to an eruption (http://www.volcanocafe.org/the-toba-supereruption/) It may not only be a magma refill: after a massive eruption a lot of weight is removed in the caldera and this will automatically give rebound, similar to that which followed the ice ages. Toba’s eruption left a hole 2 kilometer deep. So both effects probably contributed. Yes, you’re not wrong in mentioning that it’s a bit more prone to becoming blocked than a basaltic or even andesitic volcano. But right now, it still seems to be relatively open, and we’ll likely need some time before things become blocked again. 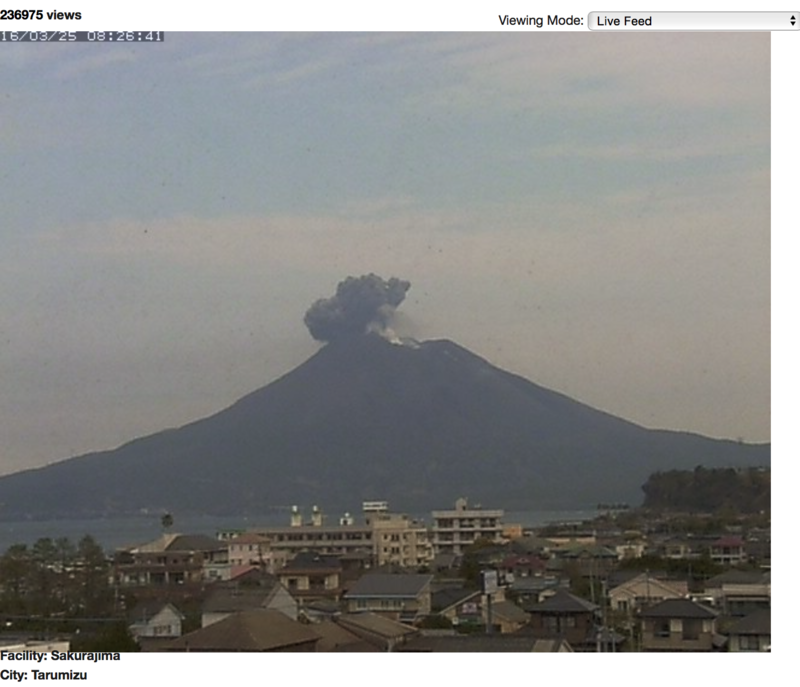 As Albert mentioned, this is pretty standard post-eruptive activity following a fairly large explosive eruption. Cordon Caulle erupted a mid sized rhyolitic eruption in 2011, which was followed by Rhyolitic lava flows (obsidian flow to be specific) for a number of years. Another easy example would be Montserrat, which has formed numerous lava domes and small collapses after the system opened up following eruption in the early 90’s. True ,but it illustrates that 35 years or so since the original 1980 eruption is a blip in the eruptive sequence of some of these systems.Interesting that the lava flows have changed from more free flowing effusion to spine like extrusions. More recent article on St Helens magma chambers. Herðubreið is showing quite a nice stack of quakes – maybe a bit of reinforcement to the intrusion of 2014? Some beautiful images of Ceres were released by NASA (htpp://www.nasa.gov/feature/jpl/bright-spots-and-color-differences-revealed-on-ceres). 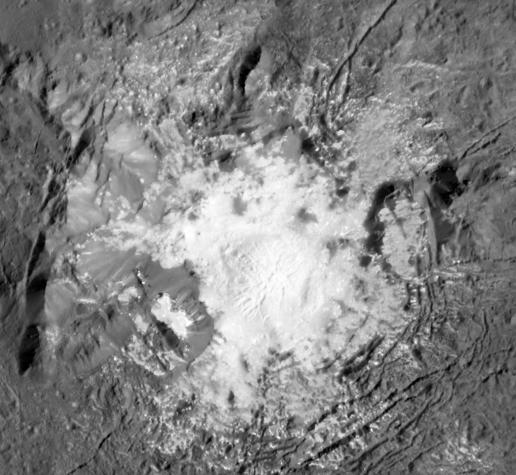 Below is a close-up of the crater-with-the-spots, or at least the central peak. Note the many cracks (and be aware some of the colour differences are due to shadows). At the top, just to the left. something that looks like a depression. There was a report that the white ‘snow’ is magnesium sulphate. Nice article Carl. Looking forward to reading the 2nd part. Amazing on what happens underground. It makes a person think about what’s going on under where you live. Last Fall a man that had lived here previously said his tractor wheel had went in a hole. When they had pulled the tractor out they discovered it’s a cave. It’s out back near our pond. We’ve looked & haven’t found an entrance nearby. He said he had fixed something on it & poured concrete. My husband said the hole is 3×3 left of center. Since then the weather has eroded the ground & now there’s a hole your foot can go thru. When I first saw it I could feel cool air coming from it. The weather was warmer then. My husband is going to use his cable from work that has a camera on the end to see how big it is. I worry about my grandchildren or one of my pets falling in it. I don’t let the kids out by the pond unless there’s one of us with them. Probably en episode of heightened activity. Lot of long period tremors there. Yup, volcanic tremor according to INETER: http://www.elnuevodiario.com.ni/nacionales/388335-momotombo-amenaza-nuevas-explosiones/ – it is apparently still ongoing with more or less continuous tremors through the night – see the “EWK MOMN NU 50: Volcan Momotombo Corto period Sixaola” helicorder here: http://geofisica-ew1.ineter.gob.ni/sismogramas/MOMN/welcome.html – no visible explosions for a few weeks though. Bravo Carl!! A really fantastic article and a thought provoking one. This definately beats watching the local Vapid News Network. Thank your for the brain candy! Ah crap, sorry folks no update tonight as was planned, I’ve been informed a have a family engagement tonight (congrats to my little cousin and her fiancé) and will be heading there straight from work. I promise it’ll be up tomorrow evening after work! You sure this is from a separate crater Mike? As a frequent watcher of this webcam, I know I’ve seen a few times where the ash from a low level eruption like this drifts in the wind before it’s visible, making it look like it’s from a separate crater. Also, I don’t see anything strange on the helicorders – so if this was from a separate crater, was likely from an already open vent. Do you have link to a map of stations? So it has been active recently. It isn’t usually. The lack of activity from Showa and the presence of activity from Minamidake suggests to me that there’s pressure built from magma flowing in and Showa is quite well stoppered at the moment. Could be interesting! Interesting stuff mike. Definitely been much less active here recently, especially compared to 2014 / 2015. After the period of high seismic unrest in 2015, we haven’t seen the same style of continues eruptions like we used to. 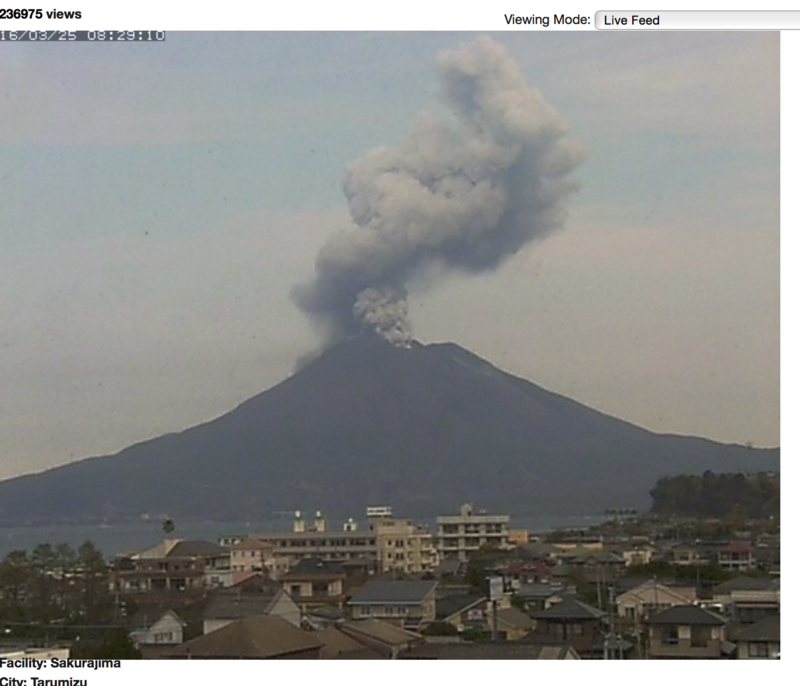 Still are a few eruptions here and there, but they seem significantly smaller and less frequent as well. So, even though there is no direct nutritional reason for the kills [herbivores vs herbivores], it boils down to a competition for resources issue. … and squirrels can be pesky. Great article! Icelands volcanism never fails to impress me. KISA CGPS station stationed on the N side of the Bardy caldera. 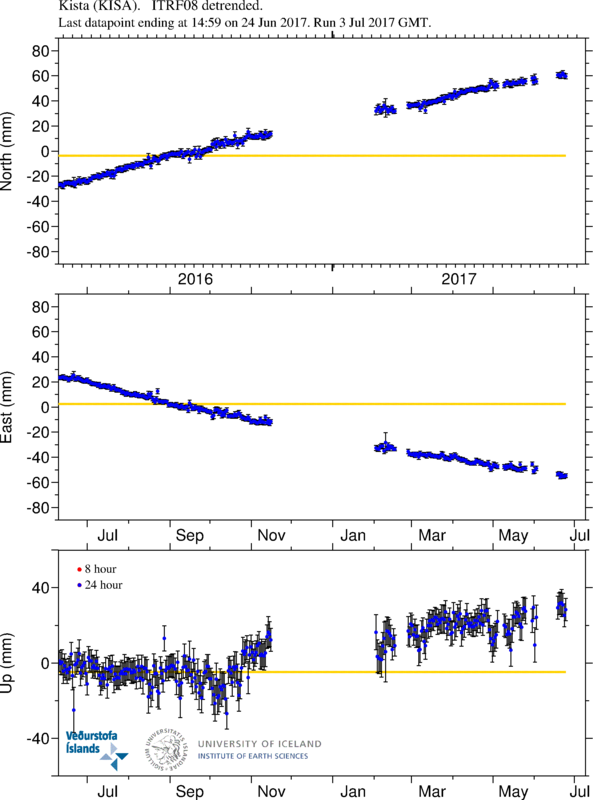 Following this, I looked at other stations, around Bardarbunga, and it is evident that something perhaps changed around September-October last year. I would not say that there is widespread inflation or something like that, because I am not a geologist or a volcanologist, and i dont have access to the full range of data. The data on the 1-year and 3-month GPS plots is not updating at the moment, so I am only left with the full range dataset. Here we see a regular and constant post-erptive pattern, with the slight change around Sept-Oct or earlier, and continuing till present day. The slight change is the a bit stronger Western component after a period of near stagnation on the E-W axis. and similar is on the N-S axis, with a small move towards north around the same period, and since a very slight North movement component. But if we would mean this out on a monthly basis, it wouldnt show much of a change. And finally the vertical component. after a near constant deflation since August 2014, with a small pause around the end of the Holuhraun events, the station has seemed to stop deflating, and has another pause, not to say inflating. here there is less data, and is easier to see, since there is less years packed in. the N-S component has been on a slow but steady N motion, but that has changed around October last year, when the North motion stopped, and even ever so slightly reversed to a slight Southward motion, but it is barely perceptible, tho it is there. The E-W axis is quite stable and has a continuous Westward movement. The vertical axis, like with DYN, also stopped deflating around September, and is now neutral, if not even slightly in inflating trend. But more longer time period is required to confirm that, since some fluctuations are common I assume on a seasonal scale. And the URH GPS sation, NE of DYN, also has similar trends, moving NW and stopped deflating, with a possible inflation signature to it, but it could be just regular fluctuations. But this one seems to be too far north to even be affected by any possible Bardarbunga inflation, tho i could be wrong of course. And image where the GPS stations are. This is an older graphic, so the vectors are not recent. It is obvious that there was some change occurring in Bardarbunga around September, and is still ongoing. I cant remember tho when the more frequent EQs began? Especially the M3s. In summer, July August? If anyone keeping record can provide that info please? Reposting the URH station, since the link seems broken above. 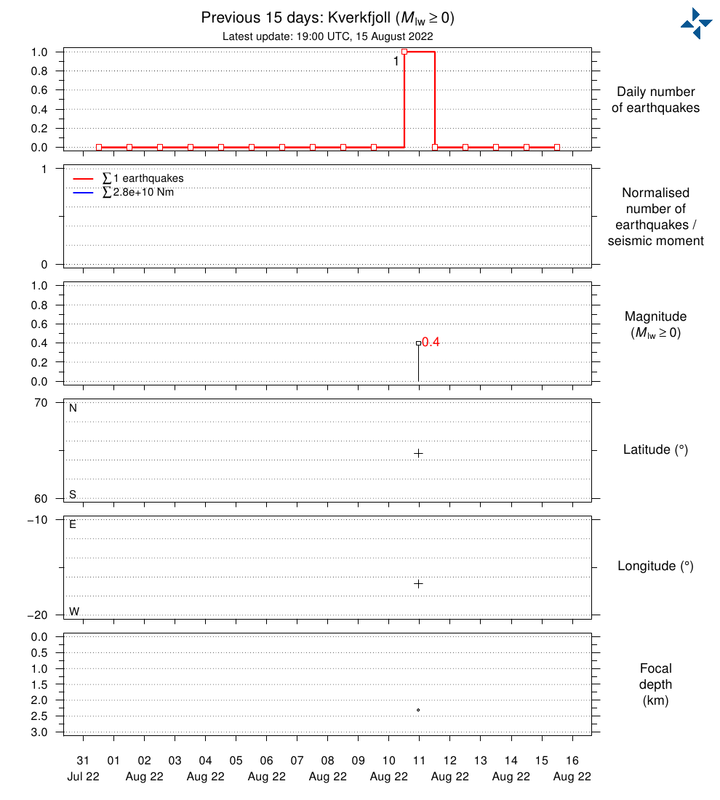 But seriously the shallow NNE earthquake activity is in much the same place as a lot of the activity in 2014,so logic would suggest a similar mechanism is at work to then but at a lower level?That is either continued settling of the ring fault after the supposed subsidence as a result of the Holuhraun eruption,or some other cause?why would the settling ring fault be “noisy” in just 2 places?Why was there a gap in activity after the large continual amount during the eruption and now restart with a spaced almost rhythmic occurrence at a much lower intensity over the last 4 or 5 months? Valid questions. Looking at the facts: the current quakes are not in exactly the same locations as the 2014/5 swarms but seem to surround the earlier locations. They are 50-100 times weaker in energy (easy to forget how strong the ‘old’ quakes were). And the current ones are mainly very shallow. The old quakes were on the main much deeper although there were a few as shallow as the current crop. Perhaps relevant, perhaps not, is that as the old quakes petered out in Feb2015, the deeper quakes petered out first and for a week or two the number of very shallow quakes seemed a first to increase, until they too turned off. And I think (but have not checked in detail) that those final shallow quakes were at the same location as the current one. The roots of the current set were already in place at the end of the eruption. Why the 10 months or so of quiescence, and what caused the new set, is open to discussion. The shallowness makes is plausible that water has something to do with it. A build up of energy that is released,before another buildup is released?,heating causing a pulse of energy to a shallow magma emplacement,which is transferred into kinetic energy via the ring fault,which is weaker than in 2014/2015,so hence the weaker earthquakes? And now Grimsvotn hits another deepy. Question – is there a rift running from Grimsvotn to Oraefajokull? I’ve been noticing more and more that there are earthquakes that seem to form along what seems to be a bit of a lineament between Grimsvotn and Oraefajokull, not entirely dissimilar to the possible rift connecting Bardy and Grimsvotn (it simply could be the same rift, extending to the other side of Grimsvotn for all I know). Potentially. I’m pretty sure that Oraefajokull didn’t just pop up of its own accord. That should be a logical continuation along the line of weakness from one of the arms of the defacto triple junction at Bárðarbunga. 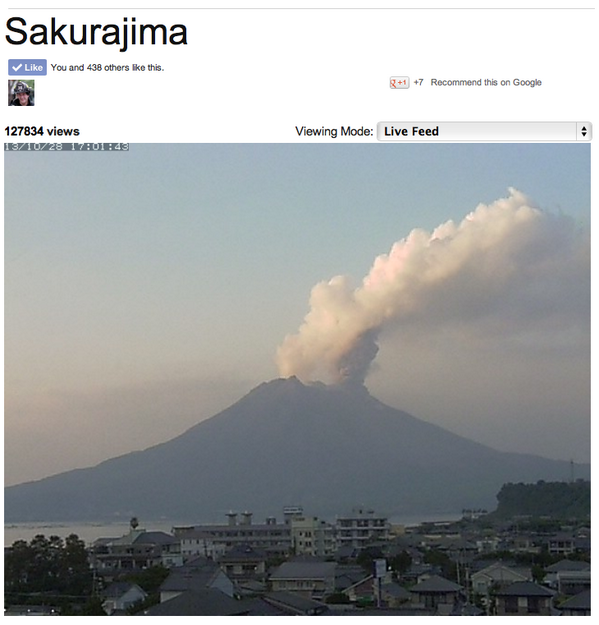 Having said that… Sakurajima DID just let off a decent blast 20 mins ago – and from the Showa crater this time. So it looks like that cork has been popped. Interesting, seems that once the reply gets over a few lines long, cannot see the button to say Post Comment. So I cannot paste, just the link. That’s really a function of the style sheet and the scripting of the WordPress site code. I’ve expeianced that sort of problem on my phone, and have had issues in FireFox, but the fire fox issue is because I had the zoom function different than what the page was scripted for. Changing the amount of zoom remedied my issues. Couldn’t do that on the phone and had to muddle my way through it looking for the post button. Also, make sure that the URL in the address bar is actually for http://www.volcanocafe.org and not some iframe that is spoofing you along rendering this page as if you are here.